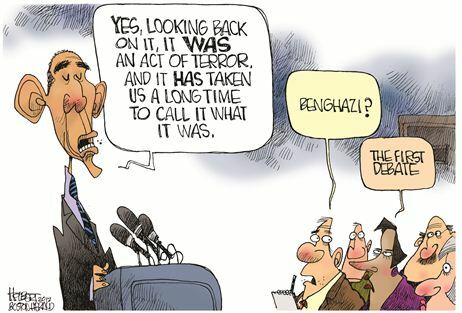 Opinion Forum » What Has the Greatest President Ever Been Thinking about during the Continuing Benghazi Kerfuffle? What Has the Greatest President Ever Been Thinking about during the Continuing Benghazi Kerfuffle? The most important matter before him, of course, reelection. During the 2008 campaign, Senator Obama ran successfully on the widely accepted notion that he was The One We had Been Waiting For. On September 11, 2012 — well before the first presidential debate on October 3rd — he may have thought that he could do almost the same during the 2012 campaign. However, since a disaster in Benghazi for which he might be held responsible could diminish his chances, it was necessary to avoid any appearance that he himself might be in any way culpable. A ruse concocted about an obscure anti-Islamic video probably looked as though it would be the most likely to work, provided an outpouring of many inconsistent facts could be delayed, perhaps until after November 6th. After all, his brilliant war on Islamophobia should be working as well as hoped. Hence, the “cooling out” process, well described by Thomas Sowell, proceeded. President Clinton had done a decent job of cooling perceptions of his amorous escapades and keeping them from becoming a bigger deal than they did (strange word, “decent,” in that context). Anybody else here remember President Nixon’s modified limited hangout — “release of previously hidden information in order to prevent a greater exposure of more important details” — during Watergate? It was a successful “cooling out” of the public, keeping them in uncertainty so long that, by the time the whole truth came out, there was no longer the same outrage as if the truth had suddenly come out all at once. Without the support of an outraged public, the impeachment of President Clinton fizzled out in the Senate. Unfortunate, but at least one other president (JFK) had enjoyed extracurricular sexual adventures while in office (but probably not in the Oval Office) with no politically adverse consequences. Then came President Obama’s Libyan misadventures, less titillating but more central to the nation’s security. We are currently seeing another “cooling out” process and another “modified limited hangout,” growing from the terrorist attack on the American consulate mission in Benghazi on September 11th. The belated release of State Department e-mails shows that the Obama administration knew, while the attack on the American consulate was still underway, that it was a coordinated, armed terrorist attack. They were getting reports from those inside the consulate who were under attack, as well as surveillance pictures from a camera on an American drone overhead. The White House knew the facts — but they knew that the voting public did not. And it mattered hugely whether the facts became known to the public before or after the election. What the White House needed was a process of “cooling out” the voters, keeping them distracted or in uncertainty as long as possible. The White House had to know that it was only a matter of time before the truth would come out. But time was what mattered, with an election close at hand. The longer they could stretch out the period of distraction and uncertainty — “cooling out” the voters — the better. Once the confidence man in the White House was reelected, it would be politically irrelevant what facts came out. In any event, President Obama, sensitive chap that he is, claims to be offended that anyone would question his candor or complain that his administration can’t seem to get its story straight. President Obama: I do take offense as I’ve said during one of the debates with some suggestion that, you know, in any way we haven’t tried to make sure that the American people knew as information was coming in what we believed happened…. Joe Scarborough: Was it the intel community that was giving you bad information early on, because the stories keep changing? President Obama: We find out there was a big breakdown and somebody didn’t do their job they’ll be held accountable. Ultimately as Commander in Chief I am responsible and I don’t shy away from that responsibility. No, Mr. President. Your “number one responsibility” was to take the steps that only the President would be in a position to take to prevent the murders of Ambassador Stevens and the three other men who gave their lives trying to protect him and others at the Benghazi mission. Now, your “number one responsibility” as the President is to tell the truth. You have an abominable track record on doing both. Unfortunately for the nation, most of the principled media did an inadequate job of covering the mess. Might there have been administration pressures not to cover the unraveling of President Obama’s balls of twine, or was it just the work of a mutual admiration society? Some readers tell me that they see The Chronicle’s failure to run a rash of front-page stories as proof of bias. They have a point, but they fail to appreciate the local emphasis in today’s front-page placement, especially during a presidential election and World Series, which the Giants, incidentally, won 4-zip. Most important is the resources issue. Most dailies don’t have foreign bureaus or reporters with the sources needed to break this type of story. “I don’t think there’s a bias issue, but we do have to rely on our primary news services,” Chronicle Editor Ward H. Bushee told me. That’s where network and other national news organizations come in – and many have produced important stories. 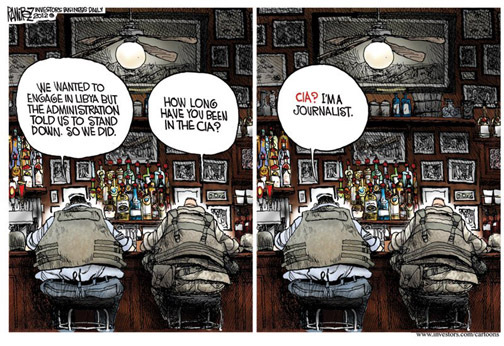 Before FBI investigators ventured into Benghazi, CNN reporter Arwa Damon found the journal of Ambassador J. Christopher Stevens, who died in Benghazi, at the mission. CNN reported on Stevens’ concern about security in Benghazi. From the Rose Garden the day after the attack, President Obama declared, “we will work with the Libyan government to bring to justice the killers who attacked our people.” Yet on Oct. 19, the New York Times reported that Ansar al-Shariah leader and suspected Benghazi ringleader Ahmed Abu Khattala was seen in a crowded Benghazi luxury hotel sipping mango juice as he claimed that no Libya authorities had questioned him and, by the way, he had no plans to go into hiding. That scoop stands in stark contrast with the Times’ failure to run a front-page story on a congressional hearing on the incident – for which the paper’s public editor Margaret Sullivan scolded the editors’ poor news judgment on Oct. 11. Fox News has been all over this story. On Friday, correspondent Jennifer Griffin reported that sources told her that a CIA team, including Tyrone Woods who also died in Benghazi, had requested military backup during the attack but was told to “stand down.” The CIA dismissed the story as “inaccurate. Of course. But we fear that ABC, CBS, NBC, CNN, The New York Times and The Washington Post will only choose to realize how obvious this is after Nov. 6. Then it will come to them – spontaneously, we’re sure. “Frankenstorm” Sandy provided President Obama much needed cover and a welcome public distraction from “Benghazigate.” It also gave President Obama an opportunity to appear presidential by advising people in the affected areas to stay safe by obeying the instructions of government officials. There was, of course, very little more that any President could have done at that time; if FEMA was not already prepared to deal with disaster relief, there would have been no opportunity with the onset of Sandy to make it so. President Obama’s FEMA guidance tour, like Kim Jong-un’s field guidance trips, was only to enhance his image as the Great Dear Leader. 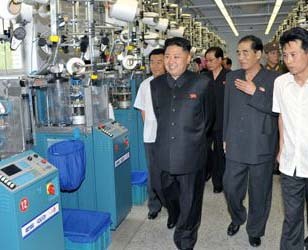 Since the recent death of Kim Jong Il, North Korean state-run media has been releasing a series of images of the “Great Successor,” Kim Jong Un, visiting schools, factories, and military facilities. These visits, which were frequently publicized by his father and his grandfather Kim Il Sung, are called “field guidance” trips — opportunities for the supreme leader to give on-the-spot advice. For decades, the North Korean myth-making machine endowed Kim Jong Il with amazing wisdom, prowess, and intelligence, and it continues that tradition now with his son, touting him as a marksman, poet, economic genius, and wise military strategist. Speaking at a photo opportunity at the American Red Cross on Tuesday, President Obama stated that in America, “we leave nobody behind.” This remark is seen as clumsy and perhaps insensitive considering the revelations that requests to assist two Navy SEALs trapped on the roof of the American consulate in Benghazi were denied, thus abandoning the heroic Americans to die at the hands of Al Qaeda. Will any of President Obama’s scapegoats step forward and throw blame back at him? Before November 6th? Thus far, the list includes Secretary of State Clinton, Director of National Intelligence James Clapper, Chairman of the Joint Chiefs General Martin Dempsey, Secretary of Defense Leon Panetta and CIA Director David Petraeus. 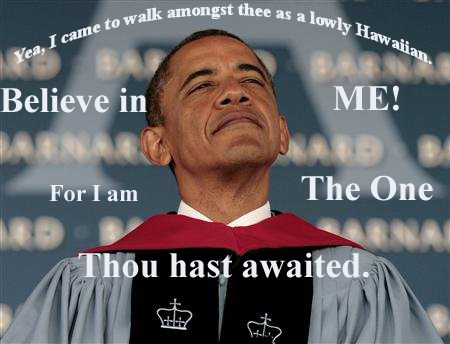 President Obama has Frankenstorms of excuses to offer but none of the enlightenment suggested by VDH. Perhaps others will eventually feel obliged, in their own interest if not that of the nation, to do so. It can have meaningful impact and set the nation back on her proper path only if done well before November 6th.